Botanica is a local neighborhood marijuana dispensary in the Buckman neighborhood of SE Portland. We pride ourselves in providing a warm professional environment for OMMP and recreational folks. We specialize in the highest quality flower, medibles and concentrates at affordable prices. Drop by and say hello! We have transitioning to a *Grams Only* system which provides price-breaks that ensures you get exactly what you want—every time. 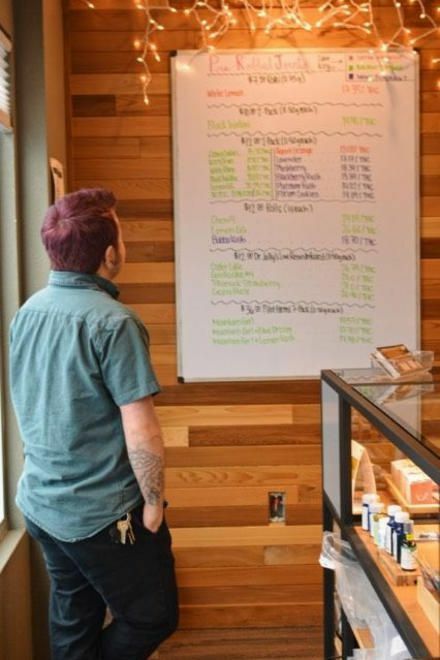 Grams Purchased	Discount Given 2 grams	$1.00 3 grams	$4.00 4 grams $6.00 5 grams	$9.00 6 grams $10.00 7 grams $12.00 Going forward, you can now purchase 3 grams from the top-shelf at $40.80 (including tax!) or mix and match between price tiers and still receive the discount! This offers you more variety at around the same cost as the current eighth price. We are excited to make this change for our customers, and are always looking for new ways to bring you quality product at a reasonable price. **PLEASE NOTE** We do the best we can to ensure that all items are listed correctly for pricing and availability, but there can be situations where the menu may not be 100% accurate. If you are interested in a specific item and/or are driving a long distance, please call ahead to guarantee the product(s) you want are on hand. We are happy to verify and hold product for up to 24 hours for your convenience.